Researchers from Carnegie Melon University and Karlsruhe Institute of Technology have recently published an article in Journal of the Royal Society titled Staying Sticky: Contact Self-Cleaning of Gecko-Inspired Adhesives that presents the first gecko-inspired adhesive that matches both the attachment and self-cleaning properties of gecko’s foot on a smooth surface. 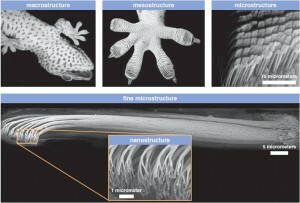 Using glass microspheres to simulate contamination the scientists created a synthetic gecko adhesive that could self-clean and recover lost adhesion. Real world applications of self-cleaning adhesives are reusable adhesive tapes, clothing, medical adhesives (bandages) and pick-and-place robots, among others. Everyday challenge with traditional adhesives is that they loose their stickiness once contaminated. Geckos have been intriguing researchers for decades because of their unique and striking capability to maintain the stickiness of their toes through contact self-cleaning. They can travel up the walls and ceilings in a wide variety of “dirty” settings retaining adhesion. Upon experimentation, scientists discovered that the critical variable is the relative size of microfibers that make up the adhesive compared to the diameter of contaminant particles. Glass microspheres were used in diameters from 3 to 215microns. Glass microspheres were packed in air and used as supplied. Contamination of the samples was achieved by brining each sample in contact with a monolayer of glass microspheres with specific speeds under predetermined compressive loads. The cleaning process involved a load-drag-unload procedure. Best self-cleaning results were obtained with the largest contaminants (glass microspheres), with the size of the adhesive fiber much smaller than the contaminating particle. This information is important to know when designing self-cleaning adhesives—make the adhesive fibers much smaller for improved adhesion recovery. This cleaning mechanism requires unloading particles by dragging. The other extreme of contaminating microspheres being much smaller than the adhesive fibers has advantages in some situations, even though it works by a different mechanism. Smaller microspheres tended to become embedded into the adhesive material. Particle embedding is a temporary cleaning process but might be sufficient in some applications.